In this role it is Mark’s job to manage all medical aspects of the company. This includes the training, supplies and ambulance services. 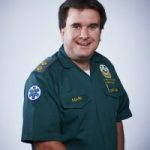 Mark’s enthusiasm for Emergency Care started at the age of 10 when he joined St. John Ambulance as a Cadet. Keith is The Resources Director. Keith’s role is to manage all of the companies resources from plasters through to ambulances. Alison is the third Director of ABC Medical Services, and is a Registered General Nurse. Alison started her training in 1990 and qualified in 1993.